The Pound drops sharply as the BoE provides a cautious outlook on the British economy and on the future of rate hikes. Even though the panel agreed to hike rates to 0.75%, they made it clear that further rate hikes will not come easily as there are still risks of a failed Brexit deal and a weakening British economy. Adding to the drop, the U.S Dollar continued its rally following Wednesday's hawkish statement from the Fed. For today, investors should look for the NFP report release which will either pump more strength into the greenback or weaken it. However, the bias remains positive for the NFP report given the series of positive economic releases from last week and this week. 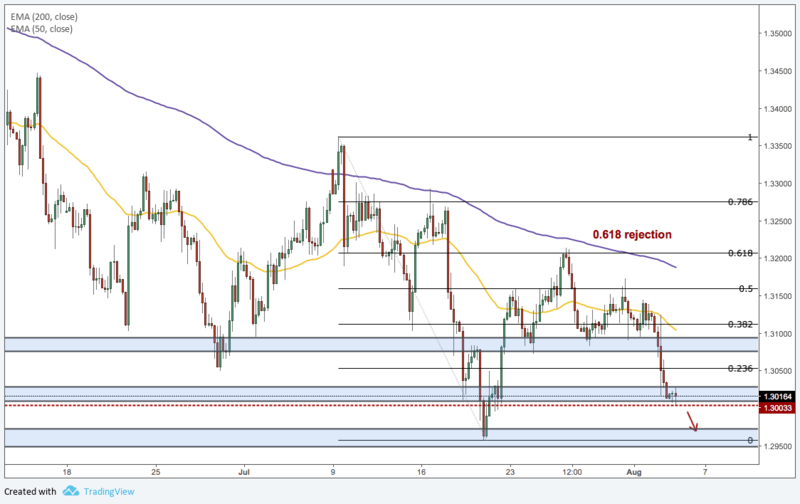 Following the 0.618 and 0.5 Fibonacci retracement rejection and the creation of a lower high, the Pound broke below the 1.30819 and plummeted down towards the next support level at 1.30033. A positive NFP report will most likely strengthen the U.S Dollar and lead to a break below the 1.30033 support level.